In InStream you can monitor all communication with your customers and business partners. Our system starts to monitor communication with your contact once you add it to the relation list. In InStream you can create any relation list according to your needs. Notice: In the Free Plan you can create one personal and one business relation list. Additionally, in the Basic Plan, you can create four personal and four business relations list. There are no limits in the Business Plan – you can create as many lists as you need. To create a new relation list you have to be an admin or have specific rights from admin. Click on the left sidebar. Next, choose the type of relation lists you want to add. If you want to create a list in which you will monitor communication with people, click on the “Personal relations” lists. If you want to create a list in which you will monitor communication with companies or group of people, click on the “Business relations” list. Type your list name. 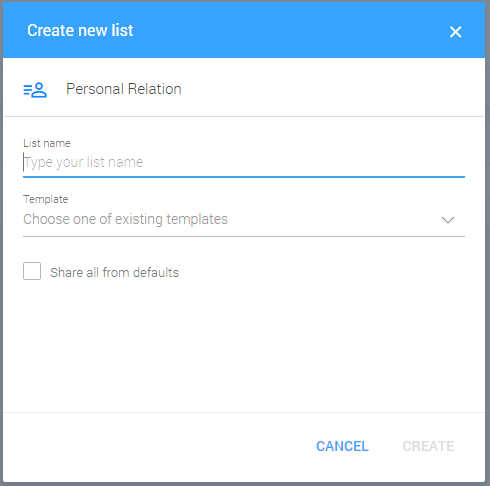 Then, you can choose the ready-to-use template of existing lists or create your own. Notice: if you choose a ready-to-use template, it will already have customized column headings. If you want to add new or delete existing fields you always have this option. Tick “share all from default ” if you want to automatically share all relations within this list with people who have access to it. To give access to this list, click on the “three dots” icon in the top right corner. Then, choose the “share” option. Once you share this list with your coworkers they will have access to all relations within this list. If you don’t want to share all your relations within this list with your coworkers, you can use other share options.